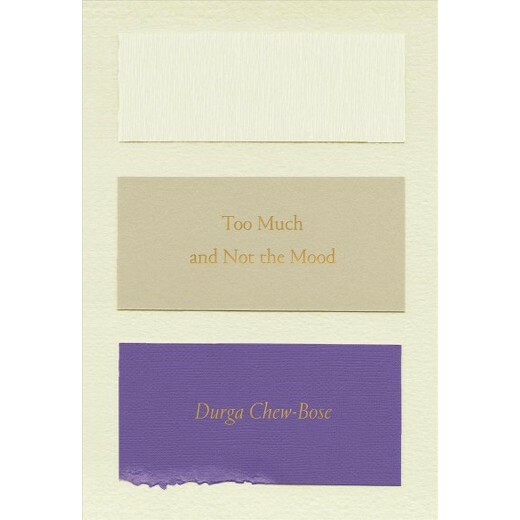 Durga Chew-Bose’s Too Much and Not the Mood is a small collection of essays printed in a charming paperback edition, and it’s perfect for carrying around this summer. A poet by inclination, Chew-Bose’s essays are lyrical and wonderfully meandering, especially the lead, “Heart Museum.” This passage is from a little further along in the book, in a piece called “Miserable.” She shows great sensitivity and power illustrating the world’s ability to disappoint. As a child, a Slinky stalled on a flight of steps caused me acute stress. The way it would cede to its coils — sometimes pause and appear to levitate — and then fail, abandoning all momentum. I couldn’t cope with the suspense. In photographs, my little hands are holding each other tight, or gripped around my wrists like clamps. Concern, far beyond my scope, was compacted into me. There’s something about a distraught child that is instantly significant. She gets it: the world is often ten seconds away from tasting like cold french fries. The world can assert itself like a category-3 shitstorm of major letdowns, and minor ones too, which I’ve learned are harder to make peace with because they are somehow inexpressible. Averting one’s attention; reacting unreasonably with no tools to recuperate; seeking sanctuary in the company of friends, who are also unprotected from feeling wrecked; mending on an empty stomach; experiencing life as if you’re watching it from behind a shoulder-high wall — ducking when it’s too much, peering over to discover more, both wise to and oblivious of everything out of view, rashly tossing your effects over the ledge and starting over with nothing. The illusion of nothing, that is. There’s no suitable language for feeling adrift when on paper you seem all right. Arguing with yourself into becoming someone else is next to impossible. And then the world disappoints. And no amount of interpretive power could have prepared you.